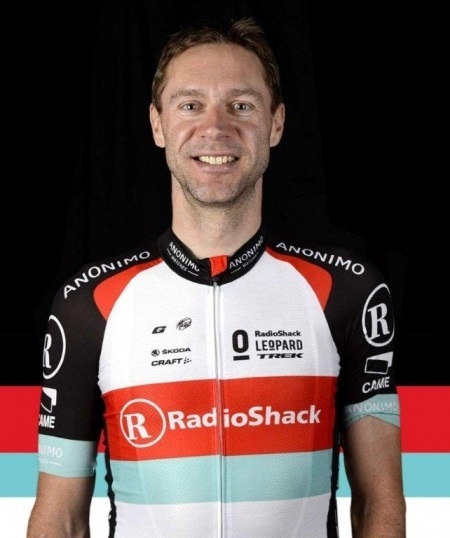 Jens Voigt (RadioShack-Leopard) won stage 5 of the Amgen Tour of California on Thursday in Avila Beach. Voigt made a race-changing split in the wind midway through the race and took the victory after attacking the breakaway in the final kilometers. Stage 4 winner Tyler Farrar (Garmin-Sharp) was second and former world champion Thor Hushovd (BMC Racing) was third, six seconds behind Voigt. Tejay van Garderen (BMC Racing) took the overall lead after making the escape group and finishing on the same time with Farrar. Michael Rogers (Saxo-Tinkoff) will start Friday’s stage 6 individual time trial in San Jose 42 seconds down on GC. Overnight leader Janier Acevedo (Jamis-Hagens Berman) is 50 seconds back. Thomas De Gendt (Vacansoleil-DCM) and Chun Kai Feng (Champion System) jumped nearly from the start. Mountains leader Carter Jones (Bissell) and his nearest contender, Marsh Cooper (Optum-Kelly Benefit Strategies), bridged across and the day’s breakaway was made. Cooper couldn’t keep pace and fell off the escape, however, leaving Jones to chase KOM points at the day’s first and only categorized climb. The American took top points at the Cat. 2 San Marcos Pass, extending his lead in the classification. Behind them, overnight leader Janier Acevedo’s Jamis-Hangens Berman teammates shared the workload with Peter Sagan’s Cannondale squad. The escape took a maximum advantage of roughly seven minutes before the peloton started turning the screws and driving the gap down. The bunch continued on, headed for a likely bunch finish in Avila Beach … until it wasn’t. A sharp headwind pelted the race with 50km to go and when Voigt saw opportunity in a forthcoming change of direction, he called his RadioShack team to the front of the peloton and blew the bunch into six groups. “Our team, we saw the race developing the way it was … we launched an attack, and we go,” said Voigt. Seventeen riders made the front split, a mix of GC favorites and sprinters: Voigt, Matthew Busche, and Markel Irizar (RadioShack-Leopard); Tyler Farrar (Garmin-Sharp); van Garderen, Thor Hushovd, and Michael Schär (BMC Racing); Baden Cooke, Mitchell Docker, Michael Matthews, and Cameron Meyer (Orica-GreenEdge); Michael Rogers and Jonas Aaen Jorgensen, and Jay McCarthy (Saxo-Tinkoff); Alex Candelario (Optum); Sagan; and De Gendt. Among the many riders missing the move were Acevedo and best young rider Lawson Craddock (Bontrager). “Just cause chaos and mayhem? Isn’t that a good enough reason?” said Voigt. “Serious now, all riders get more alert 20, 25km to go. With 60 to go, not many expect … a split is going to happen. We dropped the yellow jersey, we dropped a few good riders. We stretched everybody’s legs. Sitting second overall, at 12 seconds, van Garderen stood to gain the most in the split, though he hadn’t planned for it. The front group quickly took 35 seconds before the yellow jersey group could get organized. The gap fluctuated between 25 and 45 seconds, but Jamis couldn’t contribute to the chase and with 25km to go, NetApp-Endura led the peloton. “It was full gas for a while,” said Hushovd. Up ahead, RadioShack, BMC Racing, and Saxo were driving the breakaway, the overall standings on the riders’ minds. With Matthews in the group, Orica chipped in as well. The pressure was working and with 20km to go, the gap was above 1:00. Sagan, Farrar, De Gendt, and Candelario rode smart tactics, letting the GC riders carry the pace-making in the group. They were after the stage win and when the gap was established, they knew it was up to the riders seeking the leader’s jersey to carry the workload. Acevedo stayed buried in the peloton with 10km to go. The gap was at 50 seconds and the leaders began the downhill approach to the finish town. UnitedHealthcare, Omega Pharma, and Bontrager led the chase. Voigt attacked the group on a short rise 5km from the finish. The German veteran rolled over the top with more than 10 seconds and his former companions didn’t appear to have much urgency to follow, but the acceleration dropped Docker. Sagan looked the chase, but no one had the impetus to pull the group — including the previous day’s winner, in Farrar, and the race’s all-time winningest rider, in Sagan — toward the line. De Gendt jumped with 3km to go and Jorgensen followed, but van Garderen’s teammates continued to work for the GC gap and not the stage win. Voigt led the two chasers by 10 seconds with 2km to go and the pursuers began looking back. Sagan sat second wheel in the van Garderen group, leaving the work to Orica and Saxo. They wouldn’t see Voigt again until the final rise to the finish. The German rolled through the final corners in Avila Beach and, after a look back, finally celebrated at the top of the block-long ramp to the line. Van Garderen and co. caught De Gendt and Jorgensen and Hushovd launched the sprint from behind on the left side of the road, but Farrar held off the Norwegian for runner-up honors.